Thirty years after the Karabakh conflict, it is time for the EU to turn its attention back to Nagorno-Karabakh and do better in acknowledging the territory, writes Diogo Pinto. Diogo Pinto is the director of European Friends of Armenia. February 20, 2018 marks 30 years since the People’s Deputies of Nagorno-Karabakh Autonomous Oblast (NKAO) approved the formal petition requesting the transfer of jurisdiction from Azerbaijani to Armenian Soviet Socialist Republic (SSR). After the 1917 Russian Revolution, Nagorno-Karabakh was a self-governed territory with all specific attributes of de facto statehood. However, in 1921, Stalin intervened to reverse a decision confirming Nagorno-Karabakh as part of Soviet Armenia, putting the region under the jurisdiction of Soviet Azerbaijan. For the next 70 years, the people of Nagorno-Karabakh would repeatedly appeal to Moscow to re-establish the oblast as part of Armenia, only to be ignored. In 1985, Gorbachev’s rise to power would inaugurate a new Soviet era. His policies of glasnost and perestroika provided the political space for the people of Nagorno-Karabakh to begin their path towards self-determination after decades of mistreatment. However, the Azerbaijani SSR not only denied the petition made on 20 February 1988, but also launched large-scale pogroms and ethnic cleansing against Armenians living in Azerbaijan, first in Sumgait and later in Kirovabad, Baku, and other cities. Hundreds of innocent people were killed in their homes, and many were tortured and forced into exile. Within weeks, the European Parliament (EP) adopted the first of ten resolutions on Nagorno-Karabakh. In July 1988’s Resolution on the situation in Soviet Armenia, the EP referred to the “deteriorating political situation, which has led to anti-Armenian pogroms in Sumgait and serious acts of violence in Baku”. It also supported “the demand for reunification with the Socialist Republic of Armenia” and called upon the Soviet Union “to ensure the safety of the 500.000 Armenians currently living in Soviet Azerbaijan”. 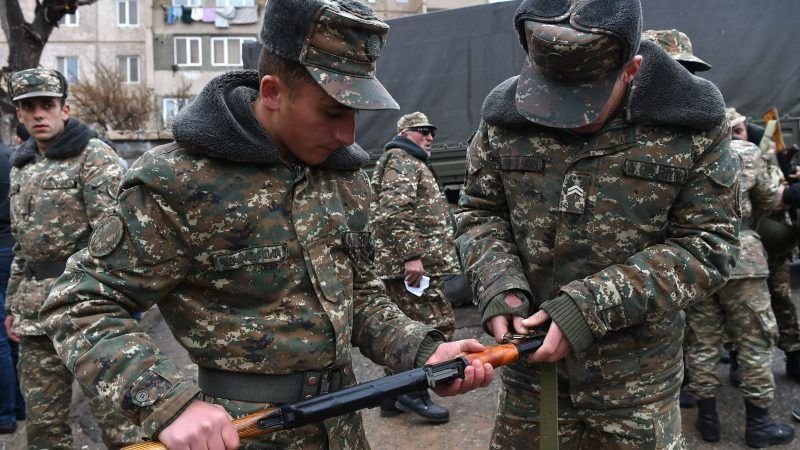 In response to lawful and peaceful pleas by lawmakers and people within Nagorno-Karabakh, Soviet authorities sent in troops, declared a state of emergency, imposed a curfew, and banned foreign journalists. What started as a peaceful movement to exercise the right to self-determination supported by European parliamentarians, was met with violence and ethnic cleansing, and turned into an all-out war in December 1991. The EP continued paying attention to Nagorno-Karabakh and, in January 1992, adopted a new Resolution on aid to Nagorno-Karabakh, noting that “Azerbaijan launched a huge and unprecedented offensive against Armenians living in Nagorno-Karabakh” and, once again, “recognizes Nagorno-Karabakh’s right to self-determination”. In May 1994, after the loss of 30,000 lives, the three sides signed a ceasefire agreement. The war was over, the conflict became frozen, and the EU turned their attention to other matters. Two years ago, full-scale war resumed for four days, demonstrating the fragility of the ceasefire. Meetings among Foreign Affairs ministers and even Presidential Summits between Armenia and Azerbaijan have resumed ever since, giving hope that some progress will be made… but the incessant provocations from the Azerbaijani side, combined with its military build-up and war rhetoric, turn staunch optimists into sceptics, making a definite solution urgent. The OSCE Minsk Group spearheads the efforts of the international community to find a peaceful solution to the Nagorno-Karabakh conflict, while the EU pursues a policy of “neutrality”, stating its full support for the “Minsk process”, but shying away from direct contact with either the population or the authorities of Nagorno-Karabakh. There is, however, a large margin of manoeuver for the EU to pursue a strategy of “engagement without recognition” with Nagorno-Karabakh and its people. After years of succumbing to propaganda by Azerbaijan, EU officials should finally visit the territory, assess the situation on the ground, and collect intelligence first-hand. Led by the EU Special Representative for the South Caucasus and the Crisis in Georgia, engagement would be non-political, and allow for the EU experience to bear fruits in Nagorno-Karabakh, too. This would not interfere with the OSCE Minsk Group mandate, nor could it objectively be seen as an implicit recognition of the authorities in Stepanakert. With its experience in conflict prevention and resolution, its financial resources, and the leverage it holds over the parties, the EU is well-placed to provide substantial support towards lasting peace and stability in the region, fully in line with its own security strategy in the Eastern neighbourhood. 30 years on, the time has come for the EU to raise its game in Nagorno-Karabakh. Would it be less simple than it seems reading these lines? Maybe… Would it be worth trying? Definitely!